CLEVELAND, OH - The Cleveland Monsters will host a special 'Monsters Moon Landing Night' presented by Dominion Energy on Saturday, March 23, at 7:00p.m. against the Hershey Bears to celebrate the 50th anniversary of the Apollo 11 Mission. 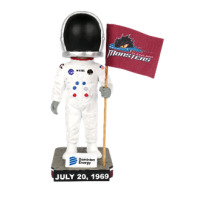 Saturday night will begin with the first 10,000 fans through the doors receiving a specialty Monsters astronaut themed bobblehead courtesy of Dominion Energy. Retired NASA astronaut Mario Runco Jr. will be on hand to drop the puck for the game and sign autographs in the first intermission at Section 123. 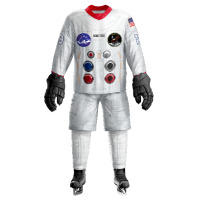 Additionally, the Monsters will be wearing specialty spacesuit-themed uniforms featuring the Apollo 11 design during the game that will be available through an online auction to benefit the Monsters Community Foundation. The auction will be held through Handbid from when the doors open at 6:00p.m. until 10 minutes after the game. Fans can get assistance and receive more information on the bidding at the Monsters Community Foundation table located at Section 128 throughout the night. The NASA Glenn Research Center will be on the concourse throughout the game with exhibits including a photobooth, a spacesuit display, a virtual reality spaceship experience, an interactive kiosk, display models and more. Fans will also have the chance to take a photo in the astronaut bobblehead face-cutout. Monsters players Tommy Cross and Paul Bittner had the chance to visit the NASA Visitor Center Exhibit at the Great Lakes Science Center on March 5 with former NASA employee JonDarr Bradshaw and the experience was filmed to be shared during the game. Cross and Bittner learned about NASA and Cleveland's impact on space exploration that will be passed along to fans in attendance Saturday night. Replica space-suit jerseys will be available for fans to purchase at Team Shop as well as special space themed items including pucks, mini wood player sticks, t-shirts and sweatshirts. Cleveland Monsters tickets for the hottest games of the year on sale now and start at only $10 per seat! Additionally, 2019-20 Monsters Hockey Club memberships, including the best seats for each game, the lowest ticket prices, exclusive year-round benefits and free gear are also on sale now. Visit https://www.clevelandmonsters.com/tickets/monsters-hockey-club or by calling the Monsters sales and service team at 216-420-0000.